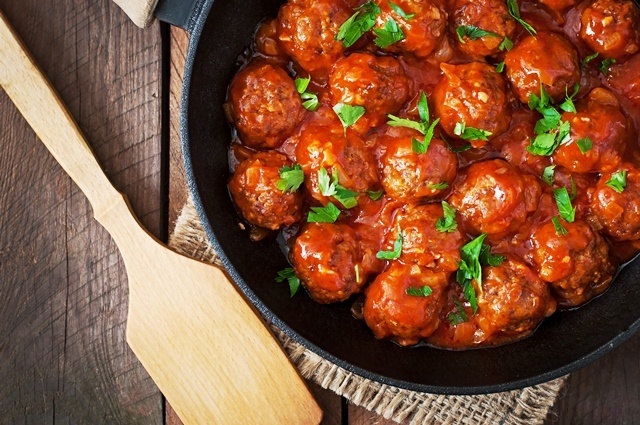 This recipe makes about a dozen large meatballs. This works great for an appetizer or side dish! When all meatballs are in the slow cooker (*see note for alternate cooking method), cover and cook on high for 1-2 hours or on low 3-4 hours until meat it cooked through (no longer pink). The cheese may start melting out of the meatballs, that’s okay! *For a quicker method, the meatballs can be baked. Follow directions to make meatballs, but instead of placing in the slow cooker, place meatballs 1 inch apart on a greased baking sheet and bake at 400 for 15-20 minutes until browned and cheese is melty. **These can also be made ahead and frozen! Prepare the meatballs as instructed in the recipe but instead of putting them straight into the slow cooker (or the oven if baking), just place them side by side in a zip lock bag ( you may need two), seal and place in the freezer. When ready to cook them, follow recipe instructions and increase cooking time slightly to allow for thawing.